'Bagdad's Folly' OGB (Lois Rich by James Whitely, R. 1992). Seedling R80-141B. AB, 30" (76 cm). Midseason bloom. 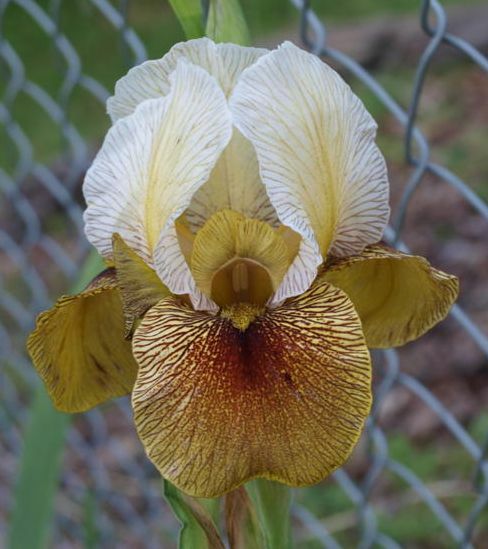 Standards off-white with pale orchid veining; faint brushing of bright yellow on midrib; cream style arms; Falls cream ground heavily veined brown; orange rust signal; dark tan beards. 'Ancient Scrolls' X R74-119B: (('Daughter Of Time' x (I. atrofusca x Kerr 53-44DF: (I. susiana x 'Andromache'))) x Marx 633A) x ('Welcome Reward' x (('Bagdad Beauty' x 'Orchid And Flame) x 'Kalifa Hirfa))). Aril Patch, 1992.